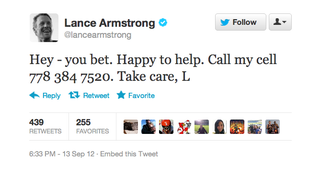 We've all seen it by now: Lance Armstrong's odd tweet, containing what looks to be his cell phone number. We figured it was the same old, same old—a direct message, mistakenly broadcast to the world. Annoying, in that he'd probably need to change his number, but funny for the rest of us. So we called it, not expecting him to pick up (since hundreds of other people are likely calling simultaneously), but at the least to see what his voicemail sounds like. It wasn't his voicemail. Are there two Tyson Laidlers? Is one of them Lance Armstrong? What is going on here? We wondered if Laidler might no longer have the number, and it had assigned to a phone Lance is temporarily using for travel to Canada. But Lance appears to be in Texas right now, and the voicemail still belongs to Laidler. Perhaps Lance accidentally typed the wrong phone number, on top of accidentally tweeting it? But that wouldn't explain the Canadian area code, and there are no area codes in Texas that are even close to 778. Ty Laidler hasn't tweeted since Aug. 31. The last person he followed was Lance Armstrong. This is a goddamned mystery.